Mope.io is one of the best iO games online that has just been published recently. As you know, the iO games have caused a new gaming phenomenon on the Internet from all over the world, and Mop.io game will become another successful Multiplayer game online sooner. Every single day, the game draws the attention of plenty of players from various countries. They can join and play against each other to gain some fun, share the experiences with each other or even start a conversation with each other using chat feature. Most of the iO games offer such great gameplays and missions, and so does Mope.io game! You will get a new chance to make your favorite “io games” list longer by adding this new game. Surely the game will give you a brand new unique gameplay that keeps you glued to it. The more you play, the better your skills will be! Now, it’s time to find out the gameplay of Mope.io, as well as check out Mope.io Mods or learn more about the in-game controls. The gameplay of Mope.io can be different from other previous iO games a bit since it offers adorable characters that you will take on a role of in the game. In addition, there will be more useful features added to the game as well, which will bring you more joys and amusement while playing. Because this is a Multiplayer game online, you will surely come across plenty of skilled players all over the world. When spawning into the game, you will play as a small mouse trying to develop your size. This basic gameplay is kind of identical to Agar.io and Slither.io, right? But, it still has some distinct points. The sources of food are so awesome in the game, you are supposed to roam around the map in order to search for the woods filled with berries. Once you see them, you must absorb from the berry bushes as much as you can in order to gain more experience points. In addition, you must reach some water spots, drink as much as possible in order to keep your mouse hydrated all the time. The more you eat, the faster your food chain will advance! Eating the berry bushes and absorb water is not the only crucial task you must fulfill! In Mope.io game, you are supposed to battle against the rival players too. Therefore, eating and surviving must go along with each other. The more you eat, the stronger you are! Eating a lot will also bring you more experience points, which can help you grow up more quickly. Just always make sure that your XP is enough or even higher so that you are able to launch your attacks to the enemies around. But if you are still a weak mouse, you must keep an eye on these powerful opponents while hunting for your foods, or else you may get eaten, which causes your game to come to an end. Your main goal is to become the most powerful mouse ranking number 1 on the leaderboard! Similar to other iO games, Mope.io also offers some interesting mods to all players. 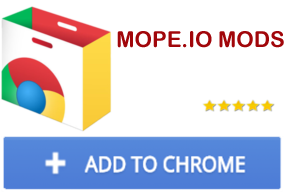 Once using Mope.io mods, you will get a chance to gain an edge over the opponents by utilizing further additional features, hacks, tricks, and awesome stuff added to the original game, which makes your game more amazing to play. Since the game has just been released, Mope.io Mods are not still available yet! 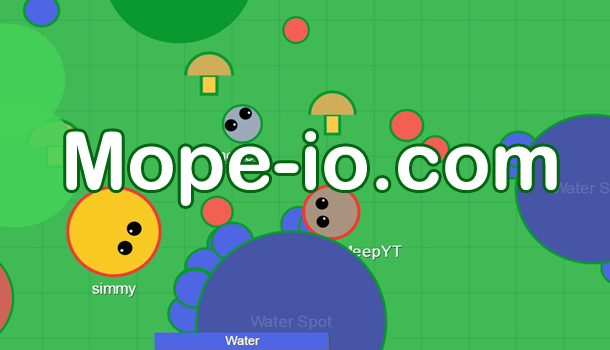 But no need to worry about if the mods will be added to the game or not, with a bunch of players joining the game day by day, sooner or later, Mope.io Mods will be developed and published worldwide. To play Mope.io game well, make sure you fully understand the in-game controls first, especially if you are completely new to the game. The controls are so simple and very easy to use. If you want to run, you just simply use your left mouse button. Also, you can fire the water or launch your attacks to the enemies by pressing key W or click right mouse button. To chat with the other players in the game, you will use key Enter! Hope you have fun and survive longer! Copyright © 2017 Mope-io.com. Powered by Mope Io.